Grasshoppers are showing up early and heavily. Kaolin clay is by far the best control and it is non toxic. If mixed with Garrett Juice Plus, PureGro and/or natural diatomaceous earth it works even better. When mixed with water and sprayed, it forms a “particle film” on plants and confuses the pests. Research from the USDA-ARS click here indicates that it provides excellent control. Reports from my listeners corroborate these findings. Kaolin Clay for pottery making is not the same. The commercial product is called Surround WP - click here for the details. Surround WP is made from 95% kaolin clay, a naturally occurring mineral. 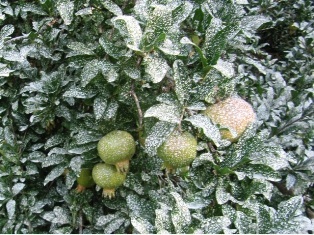 When applied to fruit trees, crops and other plants, it forms a white film. Surround suppresses a wide range of pests, especially those which damage fruit crops including pears, apples, grapes, berries, and some vegetables. The manufacturers use a super-magnetic centrifuge to refine the impurities out of raw kaolin and then filter the clay particles to a critical 1.4 microns in size. The purity and the particle size are the main reason for its efficacy. Surround WP doesn't kill insects but acts as a protection against insects, disease and sunburn. It coats the plants with a white powder film that acts in several ways to deter pests. It creates a hostile environment for insects and mites, the particles adhere to the insects acting as a strong irritant and the film creates a physical barrier to insect pests. Directions from the manufacturer: The material is porous, which allows the important processes of gas exchange to occur. In addition, Surround helps prevent sunburn damage and can enhance fruit coloring. Surround is applied as a water-based slurry and needs to be applied before pests arrive. It must be mixed well before application. Sprayer with continuous agitation is recommended. Fruit needs to be washed prior to sale. Use 50 lb/acre at 1/2 lb/gallon water. Reapplication is required every 7-21 days. Use on trees such as apples, pears, peaches, citrus, berries and some field crops. May be also used for Japanese beetles, leaf rollers, mites, thrips, codling moths, psylla, flea beetles, leaf hoppers, etc. Surround proves best effectiveness once 3 uniform applications have been made. Make back-to-back applications to get to this launching point of successful orchards. Coverage then needs to be maintained weekly for approximately four weeks. Heavy rain may necessitate additional applications. Label instructions recommend a rate of 25 lbs of Surround per acre per application. Whether you mix this in 50 gallons of water or 100 gallons of water is determined by sprayer type and the size of the trees on your acre. Coverage needs to be applied to the point of runoff and allowed to dry. A sticker-spreader isn't necessary, and in fact, experiments with vegetable oils to improve kaolin's holding power have decreased efficacy. The coverage provided by a hand-held wand spray rig is often superior to an air-blast sprayer simply because you take more time per tree to achieve a full coat.